First, I should say that I have no ironclad rules about pricing freelance jobs other than trying to figure out what the client is looking for. In the Freelance Forecast 2010 survey 70% of the clients surveyed preferred either a firm quote or not-to-exceed estimate—and only 6% chose an hourly rate—assuming the same overall cost. You’re setting yourself up with a stronger negotiating position than a take-it-or-leave-it bid, because you’re giving the client an option to remove certain elements if they’re price sensitive. For psychological reasons, if you have a high hourly rate, that can sound worse than the equivalent project cost for a freelance job cited as a lump sum. People are scared (and rightfully so) of scope creep, particularly with freelancers, and can mentally deal more easily with specific numbers. That being said, if a client wants a specific, hard number, I will provide that to her. If a client wants me to do three hours’ worth of work at Z rate, I will do that for him. Again, the first principle always needs to be determining what is most appealing to the given client…and that’s a matter of listening to subtle (and sometimes not-so-subtle) clues during your conversations. Thank you for a very interesting post. How would you go about figuring a bid on something you have just vague information on? I proofread and was asked to give a price on reading new website copy, knowing only the subject (which I can’t disclose) and how many pages there would be, but not how much copy might be on each page, and not how difficult or not the copy would be to proofread: the copy isn’t in hand yet; even the company that asked for the bid hasn’t seen anything. But they wanted a price. I assume they’re looking elsewhere since I have not heard back from them in response to what I did send, but I want to figure out what I *should* have done! Thanks. Thanks for commenting, Susan, and a great question — “vague projects” are a common challenge in the freelance world. Keep your eyes on the home page in the next few days, and I’ll give a shot at answering! Great! I’ll be looking for it. 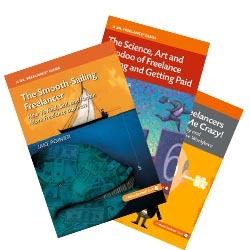 RT @drfreelance: Project pricing vs. hourly rates ##freelance http://bit.ly/cioSTU A useful pricing article from EFA member Jake Poinier.